All entries are $10 each. Submit any number of entries by digital image. One piece from the competition will be purchased for SAAC’s permanent art collection. The Annual Purchase Award is made possible through an endowment from the family of Wilma Riley in memory of her commitment to the arts, her community, and SAAC. The exhibition is competitive and open to artists 18 years of age or older living in the United States, no international address accepted. All 2-D and 3-D fine arts media accepted, including photography and computer generated work. Pieces must be original and completed in the last five years. Artwork completed under classroom supervision and/or reproduced from work by other artists or published material is not accepted. • 2-D works must be completely ready for gallery display – framed in a clean, neat and professional manner with a secure wire hanger and, if subject to damage, must be framed under plexi or glass. Work not framed and ready to hang may be disqualified. • 3-D works and Multi Media Presentations must be display ready. Work weighing over 50 pounds, presenting complex installation problems or requiring electrical power should be approved by the gallery manager prior to paying the entry fee. Work unsuitable for installation in the gallery may be disqualified. • The juror and gallery manager have final authority to define what constitutes an acceptable entry. Works may be rated unacceptable if considered unsafe or appear to be significantly different from the image submitted to the juror. ENTRIES/FEE: All entries are $10 each. All entries are $10 each. Artists may submit any number of entries by digital image. Payments online can be made with PayPal and Visa. Payments made directly through the SAAC office can be made with credit card, check or cash. Make checks payable to SAAC. Entry fee is non-refundable. Online entries can be submitted as late as Tuesday, June 6, 2017. 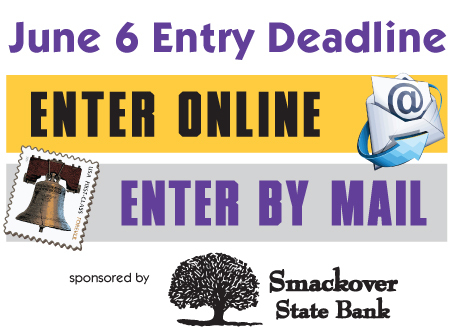 Entries mailed to the South Arkansas Arts Center need to be received by Tuesday, June 6, 2017. Enter ONLINE at www.saac-arts.org and follow the instructions. MAIL entry form, entry fee and image CD to SAAC Juried Competition, 110 East 5th Street, El Dorado, AR 71730. IMAGE SUBMISSION GUIDELINES: Digital images only accepted. Take a digital photo or scan the work. A second image of the work to show a detail or alternative view is allowed. If video is incorporated in a multi media presentation, do not send a video file but provide a link to where it can be viewed on the web. ONLINE ENTRY: Upload images with the online entry form. MAIL-IN ENTRY: Save all images on one CD and label it with the artist’s name, phone number and email. CDs will not be returned. Slides not accepted. NOTIFICATION: Juror’s notification of accepted works will be announced on June 14. A list will be posted online at www.saac-arts.org and artists will be contacted by email. To receive juror notification by mail, send a self addressed stamped envelope. DELIVERY/SHIPPING: Deliver accepted work to SAAC by July 5. Artists are responsible for delivery and pick up of all works. Return shipping instructions must be included when work is received. Work can be picked up in person on July 31 and work being shipped will be ready on Aug. 1. If using a shipping company, please send a Prepaid Ground Label or make arrangements for a call tag to pick up your work on/after Aug. 1. Work not picked up will be charged a storage fee of $10.00 per day, and after 30 days the unclaimed work will become the property of SAAC. All accepted works will be on exhibit in SAAC galleries July 6 – July 28, 2017. All work must remain for the duration of the exhibit. SALES: A commission of 35% will be charged on all sales resulting from the exhibition. Work that is not for sale must be clearly marked on the entry form as NFS. Artists are responsible for the transportation of accepted entries and expected to carry their own insurance if shipping the artwork. South Arkansas Arts Center is not responsible for damages during transport. Every precaution will be taken during packing and unpacking for the safety of each entry, but neither SAAC, its board, staff, nor volunteers will be responsible for loss or damage caused during transport. If artwork is accepted in the exhibit, artists agree to allow the artwork to be reproduced for promotional purposes. The receipt of an entry in the juried exhibition will constitute agreement by the artist with all conditions set forth in the prospectus. SAAC is excited to welcome Dylan Turk, curatorial assistant at Crystal Bridges Museum of American Art in Bentonville, Arkansas, as the juror for the 2017 Annual Juried Art Competition. Turk has curated many exhibits for Crystal Bridges including ‘Frank Lloyd Wright’s Bachman-Wilson House’, ‘Building Crystal Bridges’, ‘Shaking Hands & Kissing Babies’, Re-installation of the Early Modern Galleries and also worked as curatorial assistant on the Focus Show on Georgia O’Keeffe. He studied art history in the J. William Fulbright College of Arts and Sciences at the University of Arkansas and also studied abroad in Spain, Italy and Morocco. He also spends part of his time writing and collaborating on publications for Crystal Bridges and has had two books published, “Art in Architecture: The Architecture of Crystal Bridges” and “Frank Lloyd Wright’s Bachman-Wilson House”, as well as many articles for art publications.